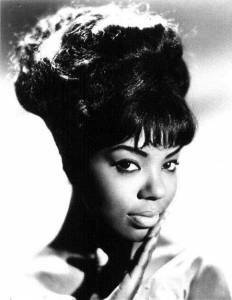 If God wanted heaven to be heard on Earth, He might have conveyed the sounds through the voice of Mary Wells. This beautiful woman and her angelic voice took America by storm in the early sixties and became Motown Records first superstar. She endured a rough childhood before finding success, and after reaching the top with Motown, Wells left the label and fell out of popularity. Tragically, more than her career fell. Cigarettes left this star with a diagnosis of cancer of the larynx, which took her voice, took her finances, and finally, took her life. Mary Esther Wells was born on May 13, 1943 in Detroit, Michigan. She never knew her father and her mother worked as a domestic servant to make ends meet. While still young, Wells was afflicted with a bad case of spinal meningitis. She suffered temporary paralysis, a loss of hearing, and she was partly blinded in one eye. After she recovered from the disease she had to learn to walk again. Once healthy Mary began to demonstrate a gift for singing. Her voice was so good that by the age of ten she was competing in talent contests in the local clubs. She also stood out in her high school choir. Her gift for singing also branched into songwriting. In high school she met a man named Robert Bateman, who was Motown founder Barry Gordy’s personal assistant. Wells told Bateman that she had written a song called “Bye Bye Baby,” and that she thought it would be perfect for Motown artist Jackie Wilson. Bateman introduced Wells to Gordy, and Gordy asked to hear the song. Mary sung it for him. Gordy was so impressed that he not only bought the song but he also signed Wells to a contract. Mary recorded the song herself and it became her first hit. The Motown years brought Wells great success. Gordy teamed Wells with the famous Smokey Robinson, who was a writer, producer, and performer with Motown. The duo made numerous hits, including “You Beat Me to The Punch,” “Two Lovers,” “Laughing Boy,” and “Your Old Stand By.” Mary’s mellow voice and Smokey’s delicate arrangements made a combination for pop music success, and in 1964 “My Guy” scored them a number one hit. “My Guy” was the first number one hit for Motown and soon Wells was one of the most popular Motown performers. She followed her number one hit with Smokey, by doing some very successful duets with Marvin Gaye. At the peak of her career Wells let her then husband, songwriter Herman Griffin, convince her that Motown was not paying her enough and that she should sue the label. Wells went to court, arguing that her contract, which was signed when she was seventeen, was invalid. The court let her out of her contract with Motown, but she never again found the success she enjoyed during the Motown Years. She signed a big contract with Twentieth Century Fox that promised album and movie deals, but she only made five songs for the company and she was never cast in any movies. She did have a top forty hit with “Use Your Head,” but after only one year with Fox her contract was cancelled. Wells signed with different labels over the next few years and did have a few nominal hits with songs like “Dear Lover” and “Dig The Way I Feel,” but she never again found the formula for success. By the end of the sixties she had retired from performing. In the eighties, a renewed interest in Motown prompted Wells to return to touring. She found that she still had dedicated fans who would come to see her perform. She successfully toured throughout the decade. In 1990, Wells was diagnosed with cancer of the larynx. The cancer was caused by a heavy smoking habit, which Wells admitted was up to two packs a day. The cancer treatment she had to undergo left her unable to sing for many years. She also had no health insurance, and the costly treatments and therapy quickly eliminated her finances. She was so financially devastated, that she was evicted from the apartment where she and her daughter lived. But her friends in the industry came to her rescue, and such notable musicians such as Bruce Springsteen, Bonnie Raitt, Diana Ross, Rod Stewart, and Elton John helped her pay her medical bills and living expenses. Wells even appeared on a special Joan Rivers television show in which she was paid tribute by stars such as Stevie Wonder and Little Richard. Determined to help the fight against cancer, Wells appeared before a Congressional Committee to argue for government funds for cancer research. In her speech she said, “I’m here today to urge you to keep the faith. I can’t cheer you on with all my voice, but I can encourage, and I pray to motivate you with all my heart and soul and whispers.” Wells continued to suffer from the cancer until July 28, 1992 when she died after a bout with pneumonia. Cigarettes had forever silenced one of the most beautiful voices ever to grace the airwaves.